My story appeared in Hell's Heart: 15 Twisted Tales of Love Run Amok on the 21st of October 2018 and is available on Smashwords and Amazon. It is a short Dark Romance story, 755 words, and the first of its kind I have ever written. 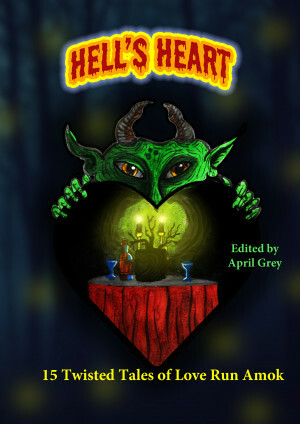 When April Grey invited me to submit to Hell's Heart, I had no idea how I was going to match the theme of the anthology with any of my works-in-progress. Never before had I written Dark Romance, which is probably the reason why my story leaned more toward the dark side than the romantic. I guess my top influences when writing this piece was Stephen King and Rayne Hall. I used to read a lot of Stephen King novels back in the day and I can see some of it in my characters and the situation they are in. I also drew from Rayne Hall's work—not only her short stories but also her Writer's Craft series, which has been a great aid in improving my writing. I also drew some influence from the Hell's Bells anthology—particularly from author Mitch Sebourn's story The Loneliest Road. I loved the point of view and the way he chose to narrate his story, and I used a similar approach in mine. And finally, I used April Grey's story also from Hell's Bells, The Black Lute, since I thought she really used attention to detail well to firmly cement the reader in the story, which I tried to reproduce by choosing the 'right detail at the right time', nothing more and nothing less. Jake T.S. Wryte is a full-time writer from the Darklands of Africa where the creatures of his imagination have a bounty on his head. You can find his fiction in Hell's Bells — 15 Tales of Wicked Tunes, Mad Musicians, and Cursed Instruments; Hell's Heart — 15 Twisted Tales of Love Run Amok, Flash Fiction Magazine; 101 Words; and his article on flash fiction writing and online courses at christopherfielden.com. When not reading or writing, Jake can be found hiking remote areas and wishing he hadn't gone there in the first place, or avoiding assault by his rescue Macaw. You can reach him on Twitter @jaketswryte and Facebook as Jake TS Wryte.